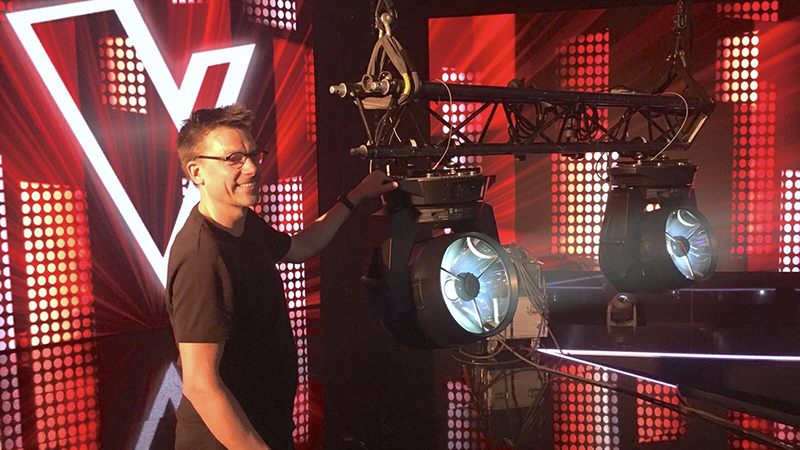 As Wendy van Dijk and Martijn Krabbé were looking for great vocal talents between 8 and 14 years old, the lighting technicians were looking for a powerful luminaire to use in the finals. The Vari-Lite VL6000 Beam was the one that drew their attention and FACE, together with Philips Entertainment Lighting, provided Light-H-Art with a handful of VL6000’s. The Vari-Lite VL6000 Beam is a feature-rich, mid-air effects light with a large 19” front aperture. It uses a new exclusive Philips ellipsoid reflector array system, producing a retro style searchlight effect from a high output column of light with a tight, 6.4° beam angle. The Philips VL6000 Beam offers a super bright output that exceeds 55,000 lumens. A range of effects can be created through its aerial beam and image projection system, with 7 gobos selected from much-loved Vari-Lite images, including a break-up effect from the VL4000 series and tri-cone from the original 500 series. The ability to adjust the sharpness of the beam edge and image appearance adds a new dimension to the traditional Vari-Lite gobos. The Philips VL6000 Beam’s dynamic static color system allows the fixture to maintain its highest output at all times. It offers lighting designers 18 direct colors from 3 color wheels as well as color mixing to achieve up to 55 vibrant combinations, including highly sought-after coppery gold and pastel colors, and endless split-color effects. The system is also ahead of the curve thanks to its exclusive Cloak Transition Generator (CTG) system, which can be used to create auto-timed fades between color combinations. This subtle but crucial characteristic allows programmers to painlessly and discretely change colors during slower moments.